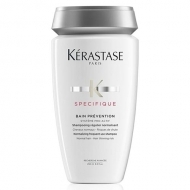 Reduces the visible appearance of flakes of dandruff up to 4 weeks after the end of treatment. 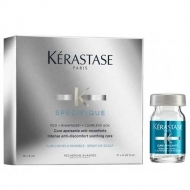 DESCRIPTION: Cure Anti-Pelliculaire Anti-Récidive from Kérastase is a treatment for scalp with oily or dry dandruff. 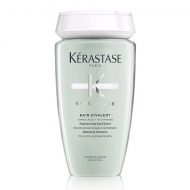 This intensive anti-dandruff treatment helps to remove the films from dry and oily dandruff. 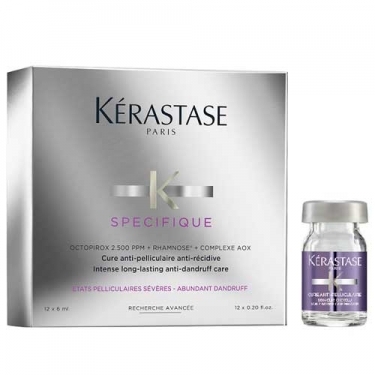 A treatment that gives the scalp its flexibility and healthy appearance, while protecting it from oxidative stress. Conceived with a set of essential ingredients, this solution is easy to apply on the scalp and offers great performance, reducing the appearance of dandruff films up to 4 weeks after cessation of treatment. Complete Formula: Aqua / Water, Alcohol Denat., Peg-40 Hydrogenated Castor Oil, Piroctone Olamine, Rhamnose, Citric Acid, Linalool, Benzyl Alcohol, Carnosine, Glycerin, Glycine Soja Oil / Soybean Oil, Tocopherol, Phenoxyethanol, Moringa Pterygosperma Seed Extract, Disodium Phosphate, Parfum / Fragrance.